Sir Peter Ramsbotham, the Governor of Bermuda from 1977 – 1980, died today at age 90. As Governor of Bermuda during one of our most tumultuous times in history, Sir Peter Ramsbotham made the decision to call in British troops during the rioting which broke out in December 1977, in the aftermath of the hanging of Buck Burrows and Larry Tacklyn. Buck Burrows was convicted of the assassination of Governor Sir Richard Sharples and his ADC Capt Hugh Sayers, and Larry Tacklyn was convicted of the now infamous Shopping Center murders. Sir Peter was the head of the Prerogative of Mercy Committee which decided against commuting the death sentence. Burrows and Tacklyn were the last men executed under British rule worldwide. In November 1977, Sir Peter Ramsbotham delegated responsibility for the establishment, finance, training, recruitment policy, community relations and equipment of the Bermuda Police Service and the Bermuda Regiment, while retaining responsibility for operational control by the governor. The peace we brought to Bermuda after the riots, and the social, economic, and political reforms we introduced, all this led the way to Bermuda becoming a true political democracy, and not continuing forever as a one-party state. 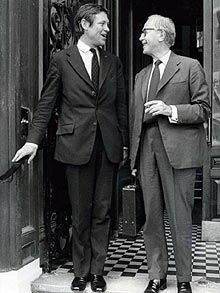 Born in 1919, Peter Edward Ramsbotham was educated at Eton College and at Magdalen College, Oxford. He was stricken with polio as a young man, but managed to recover from the paralysis. He was already working for British military intelligence wing MI5 as a civilian, when he joined the army on the outbreak of the Second World War. British army intelligence had better use for his fluency in German and Russian so quickly recruited the young soldier. Ramsbotham came out of the war a lieutenant colonel with the French Croix de Guerre. Following his retirement from military service, he went on to serve in diplomatic posts in Cyprus, Iran, Germany and the United States before serving in Bermuda. He inherited the title of Viscount Soulbury from his elder brother in 2004, and was previously appointed CMG in 1964; KCMG in 1972; GCVO in 1976; and GCMG in 1978. Serving as Governor of Bermuda was his last post before retirement. Sir Peter died of pneumonia today [Apr 9] at home in the village of Ovington in southern England, after ailing for some time. He is survived by his wife and two sons.